The District has a robust set of tools to create and preserve affordable housing, yet powerful market forces keep pushing up rents and home prices, making it hard for many families to continue living in DC, and leaving many at risk of displacement or homelessness. Addressing DC’s affordable housing challenge is the most important issue affecting the stability of families and communities, and the key to what kind of city DC will be. In its most basic terms, housing is considered affordable when a household spends no more than 30 percent of its income on housing and utilities. But that begs the question: Affordable for whom? To understand what developers and policymakers mean when they say they’re developing affordable housing, you have to ask about the income level of families they will house. What’s affordable to someone with an income of $25,000 is very different from what’s affordable to a household with $100,000 of income. In federal and DC affordable housing programs, eligibility is based on how income compares with the area median income (AMI). That is the income for the middle household in the DC region, which includes not only DC but the suburbs. Currently, the Washington region’s AMI is $117,200 for a family of four. Some people argue that it doesn’t make sense to define affordable housing programs in DC using much higher regional incomes, which is a fair point. But until that changes, the important question is the percentage of AMI that a given program targets. Some programs, like public housing, serve primarily “extremely low-income” households, which earn below 30 percent of AMI, or $35,000 for a family of four in DC. This includes many residents on fixed incomes. Other programs help “very-low income” families – under $58,600 in DC for a family of four – or “low-income” families – under $94,000. This sometimes allows developers to meet their affordable housing commitment with apartments that rent for over $2,000 a month. While families at many incomes have housing challenges in DC, where the median rent is $1,500, the most serious problems are faced by extremely low-income households. Most DC families with incomes below 30 percent of AMI spend more than half their income on rent, meaning many are at risk of eviction. Over 25 percent of households with incomes under 50 percent of AMI also spend more than half their income on rent. Above that income level, very few families are in this dire situation. Another key aspect of “affordable housing for whom?” is the kind of unit developed. Many new affordable housing units are two-bedroom or smaller and replace older buildings that had larger units. Without constructing units that meet the needs of families with children, even affordable housing may contribute to displacement. Housing stability is the foundation of health and well-being for all of us. Having a safe and affordable place to call home is intrinsically connected to positive life outcomes in school performance, job retention, physical and mental health and economic security. It ensures families aren’t forced to make difficult decisions between paying the rent or providing other essentials like food. Affordable housing means that families don’t have to worry about eviction or homelessness. When individuals and families don’t have to pay most of their income on housing, they can spend more supporting the local economy. Our national housing landscape reflects public policies and private actions that historically advantaged white families with homeownership opportunities while restricting black families to rental housing in less desirable areas of cities. In the District, nearly 90 percentof the extremely low-income households spending at least half their income on housing are headed by a person of color. Less than one percent of recent new affordable housing in DC is being built west of Rock Creek Park, where access to high-performing schools, recreational spaces and healthy foods is plentiful. And, 88 percent of of adults experiencing homelessness are black. What Tools Do We Have for Affordable Housing? Housing Production Trust Fund (HPTF) – DC’s largest affordable housing tool provides low-cost loans and grants to help build and preserve affordable homes. Local Rent Supplement Program (LRSP) – Monthly rental subsidies cover the difference between the rent a family can afford to pay and the full rent. Public housing – Funded by the federal government, public housing provides strong protections to tenants, including low rents that adjust to changes in income and unique tenant rights. Housing Choice Voucher Program (HCV) – This federal program operates much like DC’s LRSP program. Inclusionary Zoning – This program requires private-market developments to set aside a share of their buildings as affordable, at 80 percent AMI for homeownership and 60 percent AMI for rentals. The city runs a lottery to allocate IZ units. Public land disposition – When DC sells public land for housing development, up to one-third of the new units must be affordable for the life of the building. Tenant Opportunity to Purchase Act (TOPA) and District Opportunity to Purchase Act (DOPA) – TOPA allows tenant associations the first shot at purchasing their building when it hits the market. If the tenants’ attempt fails, the District can intervene and preserve some affordable homes. First Right to Purchase Assistance Program (FRPAP) – DC’s program provides assistance to help lower-income tenants exercise TOPA rights. Low Income Housing Tax Credit (LIHTC) – This is the largest federal program for subsidizing the construction of below-market-rate apartments. How Does Affordable Housing Fit into DC’s Budget? Mayor Bowser made affordable housing a hallmark of her administration, with a $100 million commitment to the Housing Production Trust Fund in her first term, and now $130 million proposed for next year, as well as investments to end homelessness. 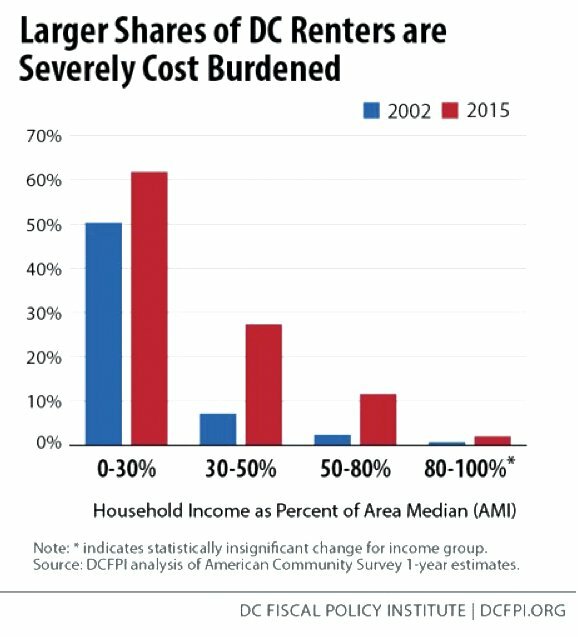 Yet, even with these investments, housing is still a relatively small share of DC’s budget – just three percent. And the amount DC devotes to affordable housing, $233 million, is far less than the $1.8 billion spent on schools and the $1 billion spent on public safety. How Can We Strengthen These Tools? The District’s efforts to create and preserve affordable housing are laudable, but only reach a small share of families in need. Nearly 50,000 families are on the DC Housing Authority’s waiting list for public housing and over 6,000 adults and children experience homelessness. The District can take steps to strengthen its many affordable housing tools. First, it can target the lowest-income residents and fully meet their needs. DC has created only 3,000 units affordable to extremely low-income families in the last four years. It would take $230 million in new Housing Production Trust Fund resources per year to put us on the path to meeting their needs over the next decade. The District also needs to greatly expand the local rent supplement program to help more low-income families bring rents down to affordable levels. Second, it should repair and preserve public housing. More than 6,500 of DC’s public housing units, 78 percent of the portfolio, are in deplorable condition and need “significant capital improvements” such as new roofs or HVAC units. These fixes would require $1.3 billion, but last year’s budget only included $3.25 million. The District should increase funding for repairs while ensuring that redevelopment efforts do not displace current public-housing residents. Third, it should plan and design for a more equitable city. The DC Office of Planning (OP) is in the process of updating the Comprehensive Plan, which guides land use decision-making including housing policy. It is critical that the OP prioritize equitable placement of affordable housing so that residents with low incomes have the same access to high-performing schools, grocery stores, transportation, thriving business corridors and other neighborhood amenities as DC’s wealthiest residents. Kamolika Das and Doni Crawford are policy analysts at the DC Fiscal Policy Institute (www.dcfpi.org). DCFPI promotes budget and policy solutions to address DC’s economic and racial inequities and increase opportunities for residents to build a better future.